Police Riot: What Really Happened? What is Killing Adult Education? An overflow, standing room only, crowd enthusiastically embraced Eduardo Martinez and Marilyn Langlois as we ick-off their campaigns for the City Council. Jeff Ritterman announced that he had decided not to run for reelection so he could spend more time with his family but was pleased that someone as qualified as Marilyn would step in. Come to the City Hall Plaza at 7 pm. What Really Happened and How It Changed Richmond Forever! On Sunday, May 5, 2002, the Richmond Police Department launched an assault on Richmond's 23rd St against the civil rights of the Richmond's Latino community. Among those attacked and arrested that evening were Richmond Progressive Alliance Co-Founder Andres Soto and his family. They were the first of more than 20 Chicanos and Mexicanos arrested that night! We will have an exciting and important panel discussion followed by a community dialogue featuring a number of people who lived through the experience. What happened on the road to seeking justice for the community changed Richmond's politics, race relations and the power structure of Richmond. Those changes are still being felt to this day as evidenced in the recent police race discrimination trial that just concluded on April 10, 2012. Andres Soto - First victim of the police assault and lead Plaintiff in Soto, et al v. The City of Richmond. Andres later ran for City Council in 2004. Che Soto-Vigil - Second victim, co-plaintiff and son of Andres Soto. Alejandro Soto-Vigil - Third victim, co-plaintiff, son of Andres Soto and a UC Berkeley student at the time of the attack. Captain Mark Gagan, Richmond Police Department - Capt. Gagan was a young Richmond police officer at the time of the assault, saw what happened from the inside of the department and how things have changed since then. Bob Sutcliffe - Former Richmond Police Commissioner who sat on the commission during the time of the complaint against the department for the 2002 5 de Mayo Richmond Police Riot. Karl Fischer - Reporter, West County Times. Karl had just started with the Times when the story broke and covered it for several years. Please save the date and share with friends and colleagues. For more information or questions please contact Andres Soto 510.237.6866 or adcsoto@hotmail.com. There are a large number of activities scheduled for May 1, or May Day as the original American Labor Day is called. In recent years the holiday has also become an Immigrant Rights Day. The March for Dignity and Resistance will begin at 3 pm at the Fruitvale BART station in Oakland and will proceed to downtown Oakland. The Golden Gate Labor Coalition is calling for a mass rally and action at the bridge at 7am on May 1. Bridge, bus, and ferry workers will be reaching out directly to commuters this week to notify them of possible disruptions to their commute and ask for their support. 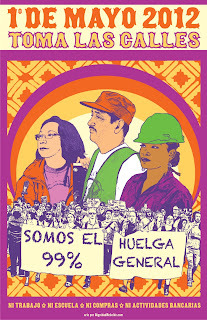 And celebrate May Day by passing the Municipal ID at the Richmond City Council 7pm. Participants must register with the Parade Staff located in the parking lot at 24th Street & Barrett Avenue in Richmond between 8:00am - 9:00am. Late arrivals will be denied entry. The parade begins at 10:00am SHARP. Please circulate the report by the California Federation of Teachers (click here to download) about how misguided policy decisions are driving the elimination of both adult education and non-credit community college classes in California. The report supports what the Communities Organized to Support Adult School (COSAS) has been saying for years and backs it up with data. Please bring it to the attention of adult education advocates and any elected officials you have contact with. The authors are trying to get this information widely distributed. Richmond, California protest Chevron on Earth Day. Chevron posted a modest 4.2 percent increase in first-quarter profits compared to 2011, increasing net gains from $6.2 billion to $6.5 billion. That still translates to more than $71 million per day in the first three months of 2012. Despite a drop in production, a 12 percent increase in average oil prices boosted Chevron's profits this quarter. Meanwhile, Chevron has faced recent protests in California, home to Chevron CEO John Watson, for environmental damage and tax dodging. Chevron CEO John Watson received $25 million compensation last year, a raise of 52 percent. Chevron's Vice President received a 75 percent increase to $7.8 million. Chevron is sitting on even more cash reserves, $18.9 billion, up from $15.9 billion in January. Has spent $3.24 million on lobbying in the first few months of 2012, after spending $9.51 million lobbying in 2011. Some of the Chevron PAC's major recipients for 2012 include House Speaker John Boehner (R-OH) ($5,000), House Majority Leader Eric Cantor (R-VA) ($5,000), Sen. Scott Brown (R-MA) ($5,000), Rep. Fred Upton (R-MI) ($7,500), Rep. Darrell Issa (R-CA) ($5,000). Chevron is in a legal battle over a $18 billion judgment for environmental damage to Ecuador's rainforest communities. According to Amazon Defense Coalition, the company has tried to block the decision four different times. In January, Chevron had a natural gas explosion off the coast of Nigeria, which killed two contractors and "caused a fire to burn for weeks," according to Reuters. Meet Adam Reich, author of newly published book, and Bay Area participants in the recently concluded 9-year struggle to unionize Santa Rosa Memorial Hospital in Sonoma County. Refreshments will be served. If you get lost or need further information, call 617-930-7327.